John Gonzalez and Amy Sherman stop by Unruly Brewing Company where they learn more about Muskegon and Lake Michigan, which Amy calls the "Greatest of the Great Lakes." Segment 1: Muskegon Mayor Steve Gawron and Lynn Vogel of the Muskegon County Convention & Visitors Bureau. 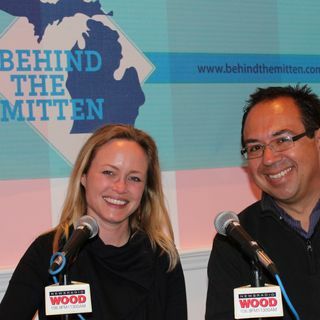 Segment 2 (Listen at): Karen Breckon of the West Michigan Tourist Association stops by to talk about beautiful Muskegon, as well as other things to do along the ... Maggiori informazioni Lakeshore. Segment 3 (Listen at 19:03): Eric Hoffman of Unruly Brewing Company stops in. The brewery has been open for three years in downtown Muskegon. Segment 4 (Listen at 29:00): John and Amy talk about Muskegon's Burning Foot Beer Festival, and BEER OF THE WEEK. This week it's Unruly's Menace, a Belgian IPA, which is made with a blend of trappist yeast and American hops.